Republican leaders, led by GOP chairwoman Ronna McDaniel, are demanding an apology from Pearl Jam for an incendiary anti-Trump tour poster. Members of the Republican Party are now blasting Pearl Jam for a seriously anti-Trump poster, one that depicts the president as a festering corpse on the White House lawn. That poster was tied into a show and fundraiser in Missoula for Montana Senator Jon Tester, a Democrat strongly backed by the rock group. In the poster, Tester is flying over the fracas in a tractor. Donald Trump is dead at the bottom, being plucked at by a vulture. “This is disgusting and Democrat Jon Tester seems perfectly OK with it,” DNC chairwoman Ronna McDaniel blasted on Twitter. The National Republican Senate Committee compared the poster to Kathy Griffin, who infamously posed with a fake decapitated head of Trump. 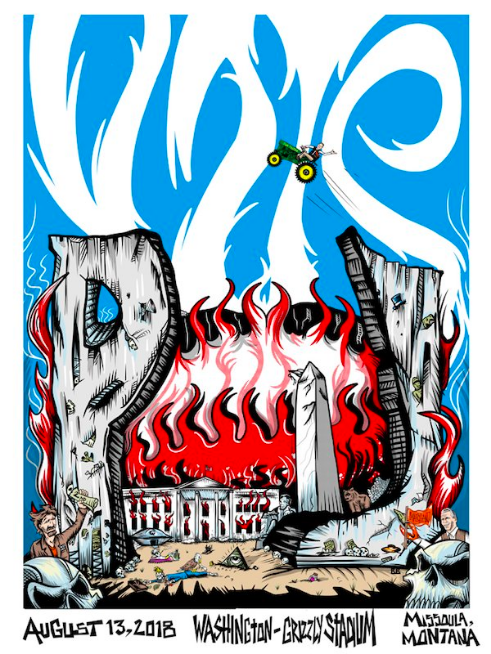 The poster itself was created by Jeff Ament with artist Bobby Draws Skulls, and firmly reflects the band’s anti-Trump leanings. Tester is apparently a fan of the group, and the feeling is reciprocated. “Nobody cares more about our country and especially Montana,” Ament also noted.